The artist interviews and recollections gathered here revisit the Times Square Show some three decades after its initial presentation. The interviews were primarily conducted by Shawna Cooper in the course of researching her master&apos;s thesis on the exhibition. Other accounts are the result of studio visits, phone conversations, and email exchanges that occurred during the organization of Times Square Show Revisited. Presented thirty-two years later, with only a fraction of the original square footage, the current exhibition makes no attempt to replicate the original. 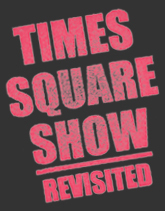 The extant exhibition floor plans and the Exotic Events poster on view in Times Square Show Revisited document the participation of more than 150 artists in 1980, though even this number grew as the show morphed over the duration of its month-long run. It proved impractical to address the work of every individual. Likewise, a significant portion of the artwork was ephemeral, performance-based, participatory, or simply lost. For these reasons, first-hand testimonials are essential for a more complete understanding of the Times Square Show. Though these reflections conflict at times, a remarkable number of intriguing commonalities surface throughout, including an interest in folk and popular art forms, references to the Vietnam War and the 1960s, a willingness and desire to experiment and work in multiple media, ruminations on how day (or night) jobs influenced art and exhibition making, and gratitude at having found a community, commingled with attendant frustration. Several artists identify themselves and others as having a sense of unapologetic self-promotion or entitlement, stemming from the shared struggle to survive as artists in New York City and perhaps most aptly distilled by Christy Rupp as a distinctly punk attitude: "a double headed monster of self absorption and insurgence." Throughout the process of organizing Times Square Show Revisited, there has been much talk about "making history." Some participants remember being cognizant that the Times Square Show was making history at the time, while others were less attuned to its impact. Today, there is incredulity that events from 1980 are already fodder for scholars, as well as concern about the proper historicization of the exhibition and the period. People have hinted, and sometimes stated overtly, "Don’t believe everything artists tell you." The cacophony of memories presented here—much like the loud voices, persistent murmurs, and spirited exchanges preserved on the audio tapes of Colab meetings—serves to check any one reading of the Times Square Show. This multiplicity of voices is indicative of the vast array of art practices accommodated by the inclusive structure of the Times Square Show. Participants ranged in age from nineteen to forty. Many of the artists never met; others remain close friends, or even spouses. As a whole, the reflections offered here preserve the distinct backgrounds, concerns, politics, and aspirations that inflected the original show. These accounts, representing only about twenty percent of those involved in the exhibition, bear out Diane Torr&apos;s insight that to produce the Times Square Show everyone was working collaboratively, and everyone was working individually.